The New York Islanders are a professional ice hockey team based in Uniondale , New York . They are members of the Atlantic Division of the Eastern Conference of the National Hockey League (NHL). The Islanders are one of three NHL franchises in the New York City metropolitan area along with the New Jersey Devils and the New York Rangers, the latter of whom the Islanders maintain a rivalry known as the Battle of New York. The team was founded in 1972 during the 1972–73 NHL season as part of a bid to keep the rival World Hockey Association out of the Nassau Veterans Memorial Coliseum where the Islanders have played since their founding. The Islanders won four consecutive Stanley Cup championships between 1980 and 1983, one of nine dynasties recognized by the NHL in its history. The future of the team, according to many commentators, depends on the success of the Lighthouse Project development plan, which would include a new arena for the Islanders. Eight former members of the Islanders have been inducted into the Hockey Hall of Fame , seven of whom—Al Arbour, Mike Bossy, Clark Gillies, Denis Potvin, Billy Smith, Bill Torrey and Bryan Trottier—were members of all four Cup winning teams. Pat LaFontaine was the most recent inductee, having been honored in 2003. With the impending start of the World Hockey Association (WHA) in the fall of 1972, the upstart league had plans to place its New York team, the Raiders, in the then brand-new Nassau Veterans Memorial Coliseum in Nassau County . However, Nassau County officials did not consider the WHA a major league and wanted nothing to do with the upstart Raiders. Since the only legal way to keep the Raiders out of the Coliseum was to get an NHL team to play there, William Shea, who had helped bring the New York Mets to the area a decade earlier, was pressed into service once again. Shea found a receptive ear in NHL president Clarence Campbell, though the New York Rangers did not want the additional competition in the New York area. So, despite having expanded to 14 teams just two years before, the NHL hastily awarded a Long Island-based franchise to clothing manufacturer Roy Boe, owner of the American Basketball Association's New York Nets. A second expansion franchise was awarded to Atlanta (the Flames) at the same time to balance the schedule. The new team was widely expected to take the Long Island Ducks name used by an Eastern Hockey League franchise; the more geographically expansive "New York Islanders" came largely as a surprise. The fledgling Islanders, who were soon nicknamed the "Isles" by the local newspapers, had an extra burden to pay in the form of a $4 million territorial fee to the nearby New York Rangers. The arrival of the Islanders effectively doomed the Raiders; they were forced to play in Madison Square Garden under onerous lease terms and were forced out of town in the middle of their second season. The team who finished last in 1972–73 received the right to pick first in the 1973 amateur draft and select junior superstar defenseman Denis Potvin, who had been touted "as the next Bobby Orr" when he was 13. Despite several trade offers from Montreal Canadiens' GM Sam Pollock, Torrey refused to part with the pick. That same summer, Torrey made perhaps the most critical move in the history of the franchise when he convinced former St. Louis Blues coach Al Arbour to come to Long Island. Even with Potvin, who won the Calder Memorial Trophy as NHL Rookie Of The Year, the team still finished last in the East in its second year. Under Arbour, the team showed signs of respectability. Although the team did not make the playoffs, they allowed 100 fewer goals than the previous season, and their 56 points represented a healthy 26-point improvement from the previous season. It turned out to be the team's last losing season for 15 years. In the next round, an even bigger surprise occurred. Down three games to none in the best-of-seven series against the Pittsburgh Penguins, the Islanders rallied to win the next four and take the series. Only two other major North American professional sports teams have accomplished this feat, the 1941–42 Toronto Maple Leafs and the 2004 Boston Red Sox (from the Major League Baseball). In the third round of the playoffs, the Islanders nearly did it again, rallying from another 3–0 deficit to force a seventh game against the defending Stanley Cup champion Philadelphia Flyers before the Flyers took the decisive seventh game at home and went on to win the Stanley Cup. The Islanders continued their stunning climb up the NHL standings in 1975–76, earning 101 points, the fifth-best record in the league. It was the first 100-point season in Islanders history, in only their fourth year of existence. Rookie center Bryan Trottier, who scored 95 points and won the Calder Trophy, was blossoming into a superstar. It would be the first of four consecutive 100-point seasons, including the first two division titles in franchise history. Unfortunately for the Islanders, regular-season success was not rewarded in the playoffs. In 1976 and 1977, the Islanders were knocked out in the semifinals by eventual Stanley Cup champions, the Montreal Canadiens. The Canadiens were 24–3 in the playoffs in those two years — all three losses were to the Islanders. In the 1977 NHL Amateur Draft, Torrey had the 15th pick and had to make a tough decision between right winger Mike Bossy and another forward. Bossy was known as a scorer who was not physical, while the other forward could check but was not very good offensively. Coach Arbour persuaded Torrey to pick Bossy, figuring it was easier to teach a scorer how to check. In the upcoming 1977-78 season, Bossy became the third Islander to win the Calder Trophy, having scored 53 goals that season, at the time the most scored by a rookie. The team was upset in the quarterfinal round in overtime of game 7 by the Toronto Maple Leafs. In 1978–79, the team finished with the best record in the NHL. Bryan Trottier was voted the league MVP and captured the scoring title, while sophomore Bossy scored 69 goals, which also led the league. Despite their regular season dominance, the Islanders exited the playoffs with a loss to the New York Rangers in the semifinals. Hockey professionals and journalists generally regarded the Rangers as an inferior team, which led them to question whether the Islanders were capable of winning big games in the playoffs when they really counted. Off the ice, the Islanders were on shaky ground. Boe was losing money on both the Islanders and the Nets even as the Islanders quickly surged to NHL prominence and the Nets became an ABA power. The Islanders were still far behind on the $10 million they had paid in startup costs, and the expenses associated with moving the Nets to the NBA threw Boe's finances into a tailspin. Eventually, Boe was forced to sell both his teams. He readily found a buyer for the Nets, but had less luck finding one for the Islanders. Torrey orchestrated a sale to one of the team's limited partners, John Pickett, who made Torrey team president. Soon after buying the Islanders, Pickett signed a very lucrative cable contract with the fledgling Sportschannel network. SportsChannel's owner, Charles Dolan, thought the up-and-coming team would be a perfect centerpiece for his new network. Dolan gave Pickett a long-term guaranteed contract intended to not only keep the team on Long Island, but give area governments an incentive to renew his cable contracts. The Islanders have been on the network, now known as MSG Plus, for over a quarter-century. Before the playoffs, Torrey made the difficult decision to trade longtime and popular veterans Billy Harris and defenseman Dave Lewis to the Los Angeles Kings for second line center Butch Goring. Goring's is often called the "final piece of the puzzle": a strong two-way player, his presence on the second line ensured that opponents would no longer be able to focus their defensive efforts on the Islanders' first line of Bossy, Trottier and Clark Gillies. Contributions from new teammates, such as wingers Duane Sutter and Anders Kallur and stay-at-home defensemen Dave Langevin, Gord Lane and Ken Morrow (the latter fresh off a gold medal win at the 1980 Olympics), also figured prominently in the Islanders' playoff success. In the semifinals, the Islanders faced the Buffalo Sabres, who had finished second overall in the NHL standings. The Islanders won the first two games in Buffalo, including a 2-1 victory in Game 2 on Bob Nystrom's goal in double overtime. They went on to win the series in six games and reach the finals for the first time in franchise history, where they would face the NHL's regular season champions, the Philadelphia Flyers, who had gone undefeated for 35 straight games (25–0–10) during the regular season. In Game 1 in Philadelphia , the Islanders won 4–3 on Denis Potvin's power-play goal in overtime. Leading the series 3–2, they went home to Long Island for Game 6. In that game, Bob Nystrom continued his overtime heroics, scoring at 7:11 of the extra frame, on assists by John Tonelli and Lorne Henning, to bring Long Island its first Stanley Cup. It was the Islanders' sixth overtime victory of the playoffs. Bryan Trottier won the Conn Smythe Trophy as the most valuable player in the playoffs. Torrey's strategy of building through the draft turned out very well; nearly all of the major contributors on the 1980 champions were home-grown Islanders or had spent most of their NHL careers in the Islanders organization. The next year, although the Islanders had won three straight Stanley Cups, more attention was being paid to the upstart Edmonton Oilers, whose young superstar Wayne Gretzky had just shattered existing scoring records. The 1982–83 season was thus a battle to decide which was the best team in the NHL. The Oilers had a better regular season, but the Islanders swept them in the Stanley Cup finals to win their fourth straight championship. Billy Smith was named the Most Valuable Player of the Playoffs after shutting down the Oilers' vaunted scoring machine. Gretzky failed to score a goal during the series. The Sutter brothers, Duane and Brent, unexpectedly led all players with 7 and 5 points, respectively, while Bossy again scored the Stanley Cup-winning goal. At this point, the Islanders had won one more Cup in 11 years than the Rangers had won in 57. After game four, the Oilers players walked past the Islanders' dressing room and were surprised to see the champions subdued and nursing injuries. Oilers players such as Gretzky and Mark Messier said that they realized at that moment how much it would actually take to win the Stanley Cup. The Islanders finished the 1983–84 regular season tied atop the Prince of Wales Conference while successfully defending their Patrick Division title. They won a hard fought series, nicknamed the "Battle of New York", over the Rangers in the opening round of the playoffs. It was the fourth consecutive season that the Islanders had beaten the Rangers in the postseason. The Islanders then defeated the Washington Capitals and Montreal Canadiens in six games each to set up a finals rematch with the Oilers. This time, the Oilers dethroned the Islanders to win the first of what would be five Cups in seven years. For the 1984 postseason, the NHL changed the home and away schedule for the finals, from two games in one arena, three games in the other to two games in one arena, three games in the other, and two more games in the first arena. Under this format, the Islanders earned home ice advantage in the series despite finishing lower than the Oilers in the regular season. However, they had to play three straight games in Edmonton, where the Oilers managed to lock up the series. Bossy said afterward that the team believed that if they could win a single away game, they would have been able to take games six and seven at home to win a fifth Stanley Cup. Out of their two home games, the Islanders had lost game one with a score of 1–0, in what was a goaltending duel between Billy Smith and Grant Fuhr, though they roared back with a 6–1 win in game two. In Edmonton, the Oilers' offensive juggernaut buried the Islanders by scores of 7–2, 7–2 and 5–2. Bossy, who had scored 17 goals in each of the past three playoffs only scored 8 in the first three rounds of the 1984 playoffs and was silenced during the final series. Though the Islanders' bid for a record-tying fifth championship was ended, Game Five was noted for rookie Pat LaFontaine's emergence, as he scored two third period goals in 38 seconds to cut the Oilers' lead to 4–2. During their run of four Stanley Cup championships and a fifth finals appearance, the Islanders won 19 straight playoff series, the longest streak in the history of professional sports (one more than the 1959–67 streak by the Boston Celtics of the National Basketball Association). Unlike the 1976–79 Montreal Canadiens, who needed to win three series in the 1976 and 1977 playoffs under the playoff format in place at that time, the Islanders had to win four series in each of their Stanley Cup seasons. The Islanders remained competitive for the rest of the decade, even as some of the stars from the Cup teams departed. As the decade wore on, Pickett began to keep the money from the team's cable deal rather than reinvest it in the team as he had done in years past. Although it did not become clear immediately, the lack of funds limited Torrey's ability to replace all of the departing talent. In 1986, Nystrom retired due to a serious injury and Clark Gillies was picked up on waivers by the Buffalo Sabres. Arbour retired as coach following the 1985–86 season and was replaced by longtime junior hockey coach Terry Simpson. During the first round of the 1987 playoffs against the Capitals, the Isles had fallen behind in the series three games to one. In previous years, the Capitals would have already won the series due to the previous playoff format. However, 1987 marked the first season that the opening round of the playoffs was a best-of-7 series instead of a best-of-5 series. The Isles evened the series, which set the stage for one of the most famous games in NHL history: the "Easter Epic". Kelly Hrudey stopped 73 shots on goal while Pat LaFontaine scored at 8:47 of the fourth overtime—and at 1:56 a.m. on Easter Sunday morning. The win came even though the Islanders had been outshot 75–52. The Islanders were beaten in seven games by the Flyers in the second round of the playoffs. Chronic back pain forced Mike Bossy to retire after the 1986–87 season. The next year, in 1988, the Islanders captured another division title, but were defeated in the first round of the playoffs by the upstart New Jersey Devils. After the playoffs, Potvin retired, holding records for most career goals (310), assists (742) and points (1052) by a defenseman (he has since been passed in these categories by Ray Bourque and Paul Coffey). Around this time, the Islanders' run of good luck in the draft began to run out. Of their four top draft picks from 1987 to 1990, the Islanders lost one to a freak knee injury and two others never panned out. A year after winning the division, the Islanders got off to a slow start in the 1988–89 season, winning only seven of their first 27 games. Torrey fired Simpson and brought Arbour back. Unfortunately, Arbour could not turn things around, and the Islanders finished with 61 points, tied with the Quebec Nordiques for the worst record in the league. It was the Isles' first losing season and the first time they had missed the playoffs since their second year of existence. Goalie Billy Smith, the last remaining original Islander, retired after the season to become the team's goaltending coach. Not long after the end of the 1988–89 debacle, Pickett moved to Florida and turned over day-to-day operations over to a committee of four Long Island entrepreneurs – Ralph Palleschi, Bob Rosenthal, Stephen Walsh, and Paul Greenwood. In return, they each bought a 2.5 interest in the team. In 1989–90, the Islanders rebounded to get back in the playoffs, but they lost to the Rangers in five games. The team bought out the remaining years of Bryan Trottier's contract, and as of 2008–09 he is still the franchise leader in games played. He signed on as a free agent for the Pittsburgh Penguins in the off-season. The next year, the team finished well out of the playoffs after winning only 25 games. The Islanders' next opponent, the Pittsburgh Penguins, were twice-defending Stanley Cup champions and full of stars such as Mario Lemieux, Jaromir Jagr and Ron Francis. The Penguins had roared through the regular season with 119 points, and were overwhelmingly favored to win a third straight championship. Jim Smith of Newsday, Long Island's hometown newspaper, predicted that with Turgeon on the sidelines, the Penguins would sweep the Islanders out of the playoffs. However, on the strength of outstanding goaltending from Glenn Healy and contributions from all four lines, the Islanders achieved a huge upset when David Volek scored at 5:16 of overtime of the deciding seventh game. Newsday's front page the day following the win was a picture of Healy with a headline reading, "It's a Miracle!" Turgeon returned to the Islanders' top line for the Wales Conference Finals against the Montreal Canadiens, though he was not in peak form as he had not fully recovered. The Islanders bowed out of the playoffs after a hard-fought five games, two of which went to overtime. After beating the Isles, the Canadiens went on to win the Cup. Maloney had avoided making many personnel changes his first year, but a contract dispute with Healy led him to sign Ron Hextall, who had his best years with the rival Philadelphia Flyers. Fans grew more skeptical when, after a series of deals, Healy ended up as the backup on the Rangers. The Islanders barely squeezed past the expansion Florida Panthers into the 1994 playoffs before being swept in a lopsided opening series by the first-place Rangers, who went on to win the Cup. Arbour retired for good as coach and was succeeded by longtime assistant Lorne Henning. Hextall drew most of the criticism for the failed playoff campaign and was shipped back to Philadelphia for Tommy Soderstrom in the off-season. In the lockout-shortened 1994–95 season, the Islanders not only failed to qualify for the playoffs, they finished ahead of only the third-year Ottawa Senators. Before the 1995–96 season, Maloney fired Henning and named Mike Milbury head coach. The same year, the Isles' attempt at updating their look resulted in the unveiling of a new team logo, which turned out to so disliked by Islanders' fans that the team reverted to a modified version of the old logo as soon as the league allowed it to do so. The year was a disappointment on the ice as well, as the Islanders finished in last place with a record of 22–50–10. During the season, team management fired Maloney, whom fans blamed for the team's downfall, and gave Milbury total control of hockey operations as both coach and general manager. During this playoff drought, instability in the front office mirrored the Islanders' substandard performance on the ice. Pickett sold the team to Dallas businessman John Spano in 1996. However, three months after the 1997 closing, Spano had only paid Pickett a fraction of the first installment on the cable rights deal. An investigation by Newsday exposed Spano as a fraud who did not have the assets required to complete the deal. Among other things, the investigation showed that Spano had deliberately misled the NHL and the Islanders about his net worth, and also had two lawsuits pending against him. Within days of the report, Spano was forced to relinquish the team to Pickett. Federal prosecutors turned up evidence that Spano had forged many of the documents used to vouch for his wealth and to promise payment to Pickett, and even appeared to have sent many of the documents from his own office in Dallas. He was sentenced to 71 months in prison for bank and wire fraud. The NHL was embarrassed when reports surfaced that it spent less than $1,000 (depending on the source, the league spent either $525 or $750) to check Spano's background. It subsequently stiffened the process for vetting future owners. Initially the team made numerous trades and increased their payroll in an effort to assemble a better team. In one transaction, youngsters Todd Bertuzzi and Bryan McCabe were traded for veteran Trevor Linden. However, after the Islanders finished 12 points short of the playoffs in 1997-98, Milstein and Gluckstern decided to run the team on an austere budget in an attempt to make a profit. They also complained about the condition of the Nassau Coliseum and made noises about moving the team elsewhere. They began trading or releasing many popular players to avoid paying their salaries, including star scorer Zigmund Palffy, team captain Linden, former rookie of the year Bryan Berard, and rugged defenseman Rich Pilon. With the loss of so much talent, the result was predictable. The Islanders finished with 58 points in 1999 and 57 points in 2000. Attendance, which had been in a steady decline over the past few years, fell off even further to under 12,000 per game. At the same time, Milstein bid hundreds of millions of dollars in unsuccessful attempts to purchase the National Football League's Washington Redskins and Cleveland Browns. In 2000, Milstein and Gluckstern sold the team to Computer Associates executives Charles Wang and Sanjay Kumar. The new owners gave Milbury the green light to spend money and invest in free agents. His first attempt proved unpopular with fans, as he traded away future stars Roberto Luongo and Olli Jokinen to the Florida Panthers for Oleg Kvasha and Mark Parrish. Milbury then further surprised the hockey world when he took Rick DiPietro with the first selection in the entry draft, ahead of the consensus picks Dany Heatley and Marian Gaborik. Reporters and fans were alternately confused and enraged by the moves, which Milbury acknowledged, saying, "As dangerous as this may be, we think Mad Mike maybe has something going for him." The "Mad Mike" nickname has remained with Milbury ever since. Milbury said that his moves were intended to improve the team immediately. In that respect, they failed completely The Islanders finished with the worst record in the NHL and the second-worst season in franchise history; the team's 0.317 winning percentage that year was only ahead of only 1972–73's .192. The team's uninspired play led Milbury to fire Isles legend Butch Goring as head coach before the end of the year. Many fans were upset that Goring and not Milbury took the fall for the lost season, and they were again upset when Milbury passed on hiring Ted Nolan as Goring's successor. Instead, Milbury tapped Bruins assistant Peter Laviolette. The team also made three key personnel acquisitions prior to the season. They acquired Alexei Yashin from the Ottawa Senators in exchange for the Isles' second overall pick in the entry draft, which the Senators used to select Jason Spezza, forward Bill Muckalt and defenseman Zdeno Chara. The following day, Islanders prospects Tim Connolly and Taylor Pyatt were traded to the Buffalo Sabres for Michael Peca, who became the team's captain. By virtue of finishing last the year before, the Isles were also able to claim goaltender Chris Osgood with the first pick in the waiver draft, adding a former championship goaltender without giving up any players in exchange. Thanks in large part to strong play by Peca, Yashin and Osgood, the new-look Islanders opened the season on a tear, starting 11–1-1–1 en route to finishing with 96 points, their best point total in 18 years. The Islanders finished one point short of their first division title in 14 years. The 44-point leap was the best turnaround in franchise history, surpassing the 1974–75 unit's 32-point jump. Had they won the Atlantic Division title, they would have had home-ice advantage in the first round. Instead, they were seeded fifth, and faced the fourth-seeded Toronto Maple Leafs. The Islanders lost to the Leafs in a very physical first round series in which no road team won a game. Game 4 featured a Shawn Bates penalty shot goal with a 2:30 to play that gave the Islanders the lead and ultimately the game. In Game 5, Gary Roberts charged Islander defenseman Kenny Jonsson and Darcy Tucker submarined Peca with a questionable check that tore the Islander captain's anterior cruciate ligament. Neither Jonsson nor Peca returned in the series. Despite the promise shown in the Toronto series, the Islanders had a slow start to the 2002–03 NHL season. They rebounded to make the playoffs but lost a five game series in the first round to the top-seeded Ottawa Senators. Milbury, known to make moves that riled the fanbase, fired Laviolette after the season, citing postseason interviews with the players in which they expressed a lack of confidence in the coach. He was replaced with Steve Stirling, who had previously been coaching the team's top minor league affiliate, the Bridgeport Sound Tigers. In 2004, the Islanders again lost in the first round of the playoffs, this time to the eventual champion Tampa Bay Lightning. Despite the fact that the Lightning finished first in the conference and the Islanders qualified for the playoffs as the 8th and final seed, a few journalists had picked the Islanders to win based on their strong regular season performance against Tampa Bay. On the day he fired Stirling, Milbury also announced that he would step down as general manager once a successor was found. Milbury served for a year as vice president of all of Charles Wang's sports properties before resigning in May 2007. The offseason was characterized by a degree of tumult. Wang hired Ted Nolan as coach and Neil Smith as GM, but he fired Smith after a little over a month and replaced him with backup goaltender Garth Snow, who retired to accept the position. The Islanders also made several free agent acquisitions, including defensemen Brendan Witt and Tom Poti as well as forwards Mike Sillinger and Chris Simon. Charles Wang also signed goaltender Rick DiPietro to a 15-year, 67.5 million dollar contract, among the longest in professional sports history. At the 2008 NHL Entry Draft, the Islanders made two trades to move down from the fifth to the ninth overall pick, with which they selected center Josh Bailey. They also added free agents Mark Streit and Doug Weight. The team fired head coach Ted Nolan later that summer and replaced him with Scott Gordon. Near the trade deadline, Snow traded Mike Comrie and Chris Campoli to the Ottawa Senators in exchange for Dean McAmmond and the San Jose Sharks' first round draft pick in the 2009 NHL Entry Draft and sent captain Bill Guerin to the Pittsburgh Penguins in exchange for a conditional draft pick, which became a third rounder. The Islanders selected John Tavares first overall in the 2009 NHL Entry Draft. After winning the draft lottery, the Islanders say their ticket sales department has seen a "300% increase in phone calls and e-mail inquiries over last year at this time" and also is "on pace" to renew 90% of its season tickets. The Lighthouse Project is the currently proposed transformation of Nassau Veterans Memorial Coliseum and the area surrounding it into a modern suburban area, introduced by current owner of the New York Islanders, Charles Wang. The project would center around a proposed renovated Coliseum for the New York Islanders. Surrounding the Coliseum would be various other venues, including a minor league baseball ballpark, restaurants, stores, and hotels. The Islanders' first logo, used from 1972-95. The short-lived "Fisherman" logo, used from 1995 to 1996. An advertising executive named John Alogna from East Meadow created the original version of the Islanders logo with the NY over a silhouette of Long Island. The current logo is similar, but features a darker shade of blue, a smaller rendering of Long Island and a blue and orange border. Before the 1995–96 season the Islanders attempted to update their look. The result was the unveiling of a logo depicting a fisherman holding a hockey stick. The logo was a marketing disaster; the reaction among the fan base was so negative that management announced it would revert back to the original logo as soon as league rules allowed them to do so. The traditional logo returned as part of 1996-97's third jersey, and then became the main jersey the following year. From time to time, Rangers fans have mocked the Isles with chants of "we want fishsticks," a reference to the way the logo resembled the Gorton's fisherman. The Islanders debuted in 1972 with traditional-style jerseys: either white with orange and royal blue stripes near the waistline and on the sleeves or royal blue with white and orange stripes. The design remained largely the same, despite minor tweaks, through the 1994–95 season. Prior to the 1995–96 season, team executives decided to change the jersey. The fisherman logo replaced the "NY" circular design, and the new uniforms incorporated navy blue and a brighter orange and introduced teal and gray shades as well. The team was seeking increased merchandise revenues, with the outward justification of connecting the team more overtly to Long Island. The jersey included a lighthouse shoulder patch, a nod to the Montauk Lighthouse , and featured uneven stripes resembling an ocean wave near the waistline, on the sleeves, and across the shoulders. All of the numbering and lettering on the jerseys also followed the wave pattern. Late in the season, the team decided to do away with the fisherman logo, but league rules forbade them from switching jersey designs for the 1996–97 season on only a few months' notice. Instead, the Islanders debuted their first third jersey, which was identical to the jerseys then worn by the team except that it used the circular "NY" crest in place of the fisherman. The team wore this jersey in approximately fifteen games during the 1996–97 season and adopted it permanently for 1997–98. The shoulder logo of the Islanders. For the 2007–08 season, the Islanders redesigned their uniforms as all NHL teams changed over to the Rbk Edge system. The current Islanders jersey resembles the prior design with a few changes. It features uniform numbers on the right chest above the logo. The name plates are in two colored format: white on orange on the home navy blue jersey and navy blue on orange on the road white jersey. On the upper arms, between the elbow and shoulders, the jersey has an additional orange stripe, where prior jerseys had no stripe. The new jerseys have a thin stripe tracing around the shoulders, and they feature "retro" laces at the neck. The Islanders' current third jersey is a royal blue throwback design resembling the jersey that the team wore in the 1970s, except with white instead of orange lettering. According to Chris Botta, the Islanders' former head of public relations, the team is hoping to adopt the third jersey as their primary uniform in future seasons. The Islanders have used the third jersey as much as possible, playing in the maximum 15 games and using the third jersey in the 2009 draft as well as the vast majority of decorative photos on the teams official website. The Islanders' team mascot is named "Sparky the Dragon", who served at one point as cross-promotion with the New York Dragons. The Islanders also have an ice crew of women, the "Ice Girls", who skate onto the ice during television breaks to clean up the snow that piles up during the game. The Ice Girls are also used for promotional purposes. The Islanders have had 12 team captains. Ed Westfall, the team's first, won the Bill Masterton Trophy during his Islanders captaincy; Michael Peca, who won the Frank J. Selke Trophy after the 2001–02 season, is the only other captain to have won an award during his term. Denis Potvin had the longest captaincy, from 1979 through 1987, during which he played 521 regular season games. Bryan McCabe served the shortest length of time, 56 regular season games. Bill Guerin was traded to the Pittsburgh Penguins mid-season in 2009. Doug Weight was named captain on 2 October 2009. The Islanders did not assign a captain for the 1996–97 season after their previous captain, Patrick Flatley, was released from his contract. The Islanders also did not name a captain for the 2000–01 season. Six New York Islanders players have been inducted into the Hockey Hall of Fame , the most recent being Pat LaFontaine in 2003. Denis Potvin and Mike Bossy were the first Islanders to be inducted, in 1991. Besides the six players, two team builders have been inducted. Bill Torrey and Al Arbour were both inducted in 1995 and 1996, respectively. All six of these players, plus Bob Bourne have since been inducted into the Islanders' Hall of Fame. The Islanders' organization also honors individuals by retiring the number they wore on their jersey. The same six players that were inducted into the Hall of Fame have had their numbers retired in Nassau Veterans Memorial Coliseum , meaning that nobody can ever use that number again while playing for the Islanders. Each player with a retired number has their own banner that hangs in the rafters at the Coliseum. There is are two other banners hanging with the retired numbers. One is for Al Arbour in recognition of the 1500 games he coached for the Islanders. The other banner is for Bill Torrey, who held the title of General manager, Vice president, President, and Chairman of the Board for the Islanders organization from 1972 until 1993. Torrey's banner features the words "The Architect" and a bowtie, which was his trademark, in place of a number. 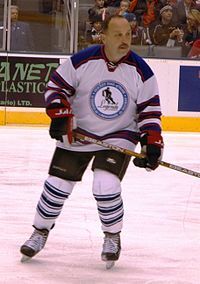 Bryan Trottier has played more games (1123) with the New York Islanders than any other player in the franchise's history. Below are the top-ten point-scorers in the history of the Islanders' franchise as of the end of the 2008-09 NHL season. Most games are shown locally on sports channels MSG Plus and MSG Plus 2. Evening games are usually carried on 94.3 WMJC and 90.3 WKRB in Brooklyn . All afternoon games are on WHLI 1100 AM. Beginning with the 2009-10 NHL season, the radio broadcasts are simulcast alongside the television broadcast.